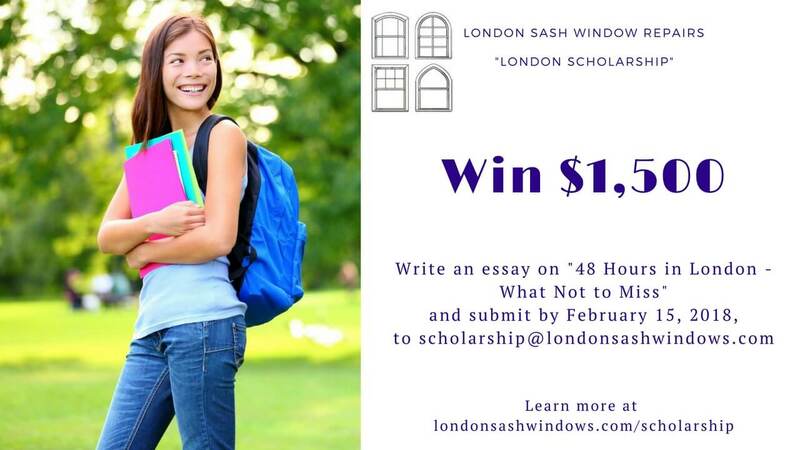 London Sash Window Repairs Ltd is offering a scholarship to students all around the world. Please read the details below. London Sash Window Repairs Ltd is a sash window repair company based in London. Our team of experienced carpenters specialise in sash windows and are always ready to take on a new challenge. We love our city and want to do whatever we can to make it look better, and our way to do it is by installing amazing sash windows to people’s homes. We improve our client’s property through draught proofing sash windows and wherever possible, should the client so wish to improve warmth and sound proofing to their home, we will install double glazed sash windows. These services reduce the amount of energy required to stay warm and comfortable, while also improving carbon emissions, which is a hot topic in London at the moment. Providing a yearly scholarship to one talented student is the least we can do to support young people passionate about education and living a better life. This year, we chose a topic that fits students all around the world, whether or not they have visited London. Those who did (or live in it) can write from first-hand experience. Those who didn’t can research and use their imagination. The topic is “48 Hours in London – What Not to Miss”. Feel free to be creative and use all the resources you have. Write a 2,000-word essay on topic “48 Hours in London – What Not to Miss”. If you live or have been in London, we’re sure you have plenty of inspiration. For those who never visited the city, do the research and write about the things you would certainly visit if you had the chance to spend 2 days in it. – Do all this before February 15, 2018. – We will announce the winner on our website on February 20, 2018. The winner will be contacted so we can send them the check. – Note that by sending us your essay, you automatically accept that we may share it on our website. Your personal info will remain safe with us and be used only for the purpose of contacting the winner. One last thing: the last year’s winner can’t apply.